There are so many health benefits to pumpkin and I love it so much I am always trying to find a new way to enjoy it. Pumpkin is packed with vitamin A and fiber and low in calories. There are studies showing it can protect you against cancer, is good for your skin, good for you immune system, and they can boost your mode. Maybe that I why I am so happy and love fall. Also pumpkins are great for after a workout! They have more potassium than a banana and extra potassium helps restore the body’s balance of electrolytes after a heavy workout and keeps muscles functioning at their best. I recently roasted a pumpkin and only needed half but decided to cut it in half to use the bottom for pumpkin soup or something else I wasn’t sure. 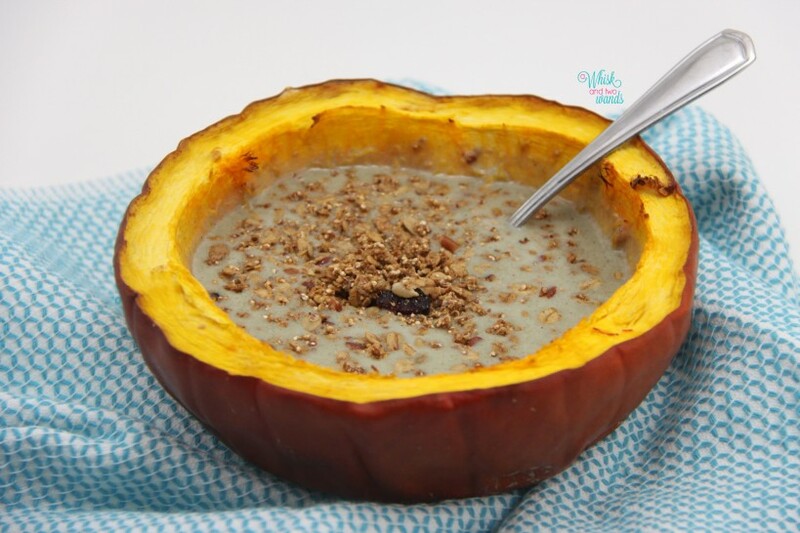 When I woke up the next morning I decided to enjoy the roasted pumpkin bowl for breakfast. It was so good I tried it a different way the next day. 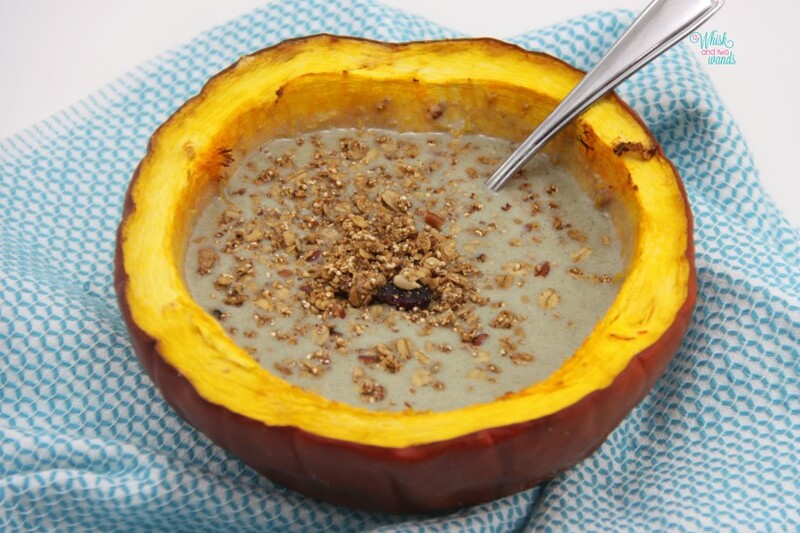 This pumpkin bowl can be enjoyed hot or cold, with coconut milk, chai milk, or vanilla or chai protein smoothie/milk (I like it a little thinner like milk in this recipe). Sprinkle with your favorite granola, seeds, nuts, or dried fruits and you have a nutritious nutrient packed breakfast! My favorite protein combo is with chai protein and cranberry pecan granola. My favorite non protein version to date is warm vanilla coconut milk or pumpkin spice coconut milk with roasted cinnamon pumpkin seeds, bananas, and goji berries. You can reheat the pumpkin or enjoy it cold. Place roasted pumpkin half in a bowl or on a plate. 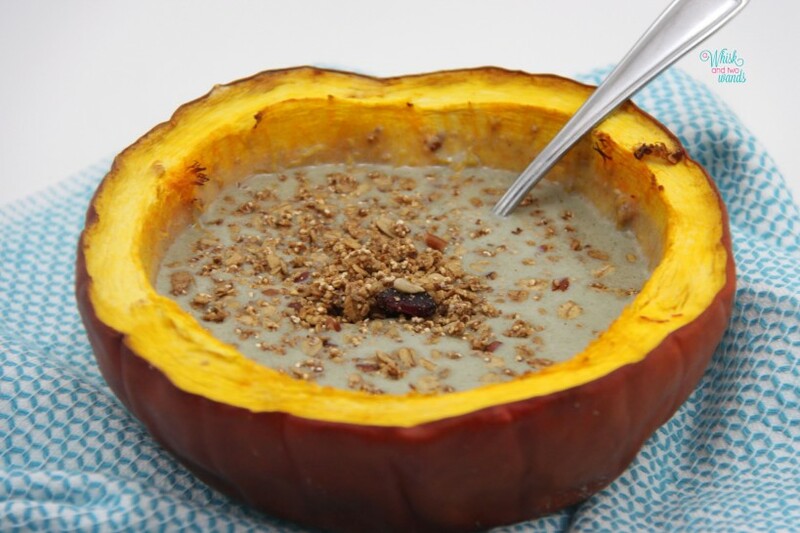 Mix together milk and protein powder and pour into pumpkin bowl, top with granola, nuts, seeds, fruit, or anything desired. Enjoy! As a Vega Recipe Ambassador I receive some Vega products, which I used as an option in this recipe. I use Vega not because it is given to me , I do purchase many on my own as well, but because it has been my plant-based protein of choice since before I started blogging and some recipes are made with Vega products I purchase. I only write about foods I love, my blog is an extension of my hobby to make fun healthy food creations for me and my family. I do not make any money off any Vega sales or posts. seriously can’t wait to try this!!!! LOVE! Thank you I hope you enjoy it! so pretty! And so smart! yummy yummy! I wish I could have this, but I can’t have pumpkin. Always happy to hear there are others out there with the same tastes! This is absolutely stunning and looks phenomenal, as always! Yes they do, as long as you are careful with you spoon and don’t poke through them! 😉 Thank you, I am not a fan of cookbook recipes without photos so I went to the extreme and if I could would just have photos without titles. This might be a dumb question but how do you roast the pumpkin? I have never roasted a pumpkin before. Sorry I thought I linked to another post of mine with it. You preheat the oven to 350, cut the top off, and you clean out the inside of the pumpkin and can roast it whole for about 45 minutes or quarter it and place on a baking sheet and roast 30-45 minutes (depending on the size of your pumpkin). I hope that helps.